I guess that makes me a comic geek as well! My brother and I used to fight over who got to do the fold-up at the back. I may just need to seek out this MAD magazine special edition, for old time's sake. i grew up with the classic 70s MAD movie parodies, and the drucker art set the standard for me. like you i drifted away as i slipped into adulthood and came back around when i had girls old enough to (i thought) appreciate the humor. and you're not mistaken, the magazine is raunchier today, but it is still and accurate reflection of the world it satirizes; the world, or american culture at least, has gotten raunchier in the last 30+ years. 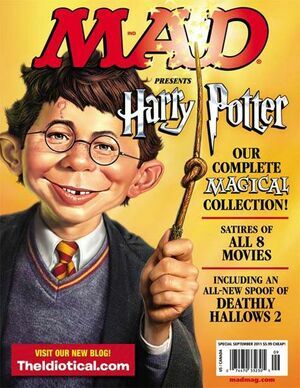 funny thing though, at the same time i was showing my girls MAD magazine, which they found mildly amusing, i also showed them the MAD paperback collections i grew up with and they LOVED those. there are three treasured comics collections in our house that the girls go back to again and again: the complete CALVIN & HOBBES, the complete FAR SIDE, and the complete DON MARTIN. all to say that it would be nice to think that MAD was carrying on some of its finer traditions to upcoming generations, but i don't think it's going to show up in interviews as being as influential to kids as it used to be. Barbara: This one comes with 2 Harry Potter themed fold-ins! David: Good point about the magazine keeping up with the times. I mean, it always, intentionally, somewhat inappropriate (which, let's face it, was half the appeal as kids). But what was slightly inappropriate then has changed dramatically. 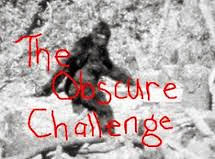 It's more noticeable when I watch 80s movies with my kids. It seems that we've since moved to being far more prudish about language (there was swearing in every 80s kids movie) and far more open with other stuff. I know I said I was not a comic fan either, but I loved Mad and Cracked. This looks good, I'll see if I can order it here.